Morecambe suffered a disappointing defeat to fellow strugglers Yeovil at Huish Park. 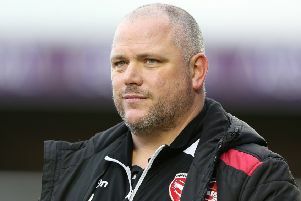 In a game which boss Jim Bentley had described as a ‘must not lose’ clash against a team at the wrong end of the table the Shrimps were undone by a late wonder goal from Yeovil sub Ryan Seager. He was the hero of the hero of the hour for the home side as after taking the ball with his back to goal beat Mark Halstead with a dipping 25 yard strike that went in off the underside of the crossbar. It was a second successive win for the Glovers to take them a point above Bentley’s side. This was a real blow for the Shrimps’ relegation fight especially after they looked the better side for long periods of the game. Morecambe, who brought in Aaron Collins and Rhys Oates for Kevin Ellison and Carlos Mendes-Gomes, started well with Ritchie Sutton’s looping header grazing the woodwork from a Jordan Cranston corner. Then Oates sent an overhead kick over from close range after another Shrimps corner caused problems. Morecambe took a deserved lead in the 22nd minute with Richie Bennett’s third goal for the club since his January move from Carlisle. Collins provided the assist when he did well to chase down a loose ball down the right-hand side before cutting inside and crossing into the six yard box for the unmarked Bennett to head home from close range. Yeovil hit back with Courtney Duffus firing wide after a good run in the box, before Shrimps keeper Halstead pulled off a brilliant, low save to palm away Matt Worthington’s effort from 12 yards after being well found by Alex Dobre. Morecambe pressed for a second in the early stages of the second half with Piero Mingoia denied by a superb Baxter save just 27 seconds after the restart. But Yeovil turned the game with two goals in three minutes from Tristan Abrahams. The first came following some good work by Dobre, teeing up Abrahams who provided neat finish to fire under Halstead from 12 yards out. The home side went ahead on 62 minutes when Abrahams was found free in the box to finish past Halstead again from 12 yards to turn the game on its head. 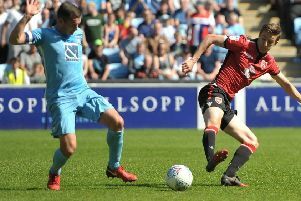 To their credit Morecambe hit back with Steven Old bringing them level seven minutes from time with a neat left-foot finish from Liam Mandeville’s cross and the game looked set for a draw. But then with time running out Seager collected the ball 25 yards from goal. And after what looked a handball in the build up, Seager let fly with a stunning effort to give Yeovil the vital three points and leave the Shrimps licking their wounds after conceding another costly late goal. Yeovil: Baxter, Browne, Showunmi, Graffiti, James, Abrahams, Santos, Worthington (Pattison 53), Dobre, Fisher (Zoko 56), Duffus (Seager 80). Subs (not used): Nelson, Mugabi, Ojo, Arnold. Morecambe: Halstead, Mills, Old, Sutton, Conlan, Kenyon (Mendes-Gomes 80), Cranston, Mingoia, Collins, Oates (Ellison 69), Bennett (Mandeville 68). Subs (not used): Roche, Dalby, McKay, Hedley.